Corn and soybeans are typically planted sometime in May and mature from mid-to late September. Consequently, their growing seasons in NY are considered to occur from May 1 through September 30, with the understanding that an additional ~100 growing degree days (GDD) can be accumulated in October before the first fall frost; offsetting the loss of ~100 GDD from May 1 until either crop is planted. The 2014 growing season started slowly for both crops because of wet conditions during the first 20 days of May in most grain corn and soybean growing regions. Consequently, only 15% of corn and less than 1% of soybeans had been planted in NY by May 15th. The second half of May was dry in most regions so 58% of corn and 31% of soybean had been planted by June 1. By June 8th, 79% of corn and 46% of soybean had been planted by June 8th. Consequently, almost half of the NY corn crop (probably 75% of the grain corn crop) did not accumulate the typical 300 GDD that most grain corn and soybean regions receive in May. In addition, growing conditions were cool from mid-July though most of September and there were reports of isolated frost in some parts of the state on the morning of September 19th. So what is the outlook for grain corn and soybeans in NY in 2014? In many respects, the 2014 growing season was similar to the 2013 growing season; mostly wet soil conditions in the spring and summer, followed by cool August and September conditions, and even a light frost in isolated pockets of the State in mid-September, although not in the major grain corn and soybean growing regions. So let’s examine both growing seasons and see if the 2014 crops will be similar to the 138 bushel/acre corn crop (3rd highest state average on record) and the 48 bushel/acre soybean crop (tied for the highest state average on record) in 2013. About 70% of the grain corn and 85% of NY soybeans are grown in western NY and the Finger Lakes regions so my discussion will mostly be in the context of the growing season in those regions. The second half of May and the month of June were exceedingly wet in 2013 (Table 1), resulting in drowned out grain corn in poorly drained areas of many fields. In addition, the somewhat poorly drained areas of most fields had stunted corn that was yellow during grain-filling because most of the pre-plant or at planting N fertilizer denitrified. Despite ideal growing conditions for the remainder of the 2013 growing season (more than adequate precipitation in July and August and below normal growing degree days from July 20 through September, Table 2), the damage had been done. So instead of the projected 150 bushel/acre grain corn yield ,based on grower surveys in October and November (who apparently were just looking at the high-yielding corn in the drained areas), the final crop came in at 138 bushels/ acre because of the early-season damage to the crop. Soybeans, on the other hand, are not quite as sensitive to wet soils in June and can fill in somewhat if gaps occur due to drainage problems. Consequently, soybean yields came in 1 bushel/acre higher than the projected 47 bushel/acre crop, based soybean grower surveys in October and November. Table 1. 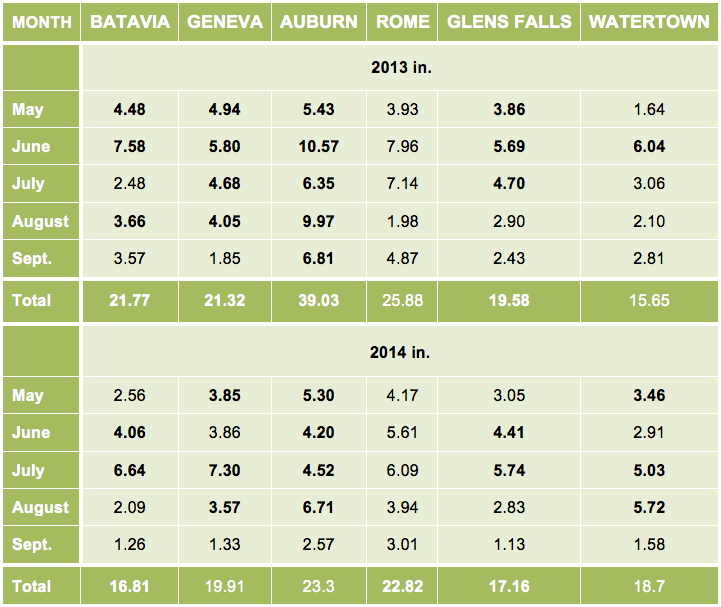 Monthly and total precipitation during the 2013 and 2014 corn and soybean growing seasons. Bolded numbers indicate above-average precipitation compared with the 30 year mean (excluding Rome, which only has 9 years of data). What about the 2014 crops? Well, the late planting of corn in 2014 may have been been a blessing in disguise (because both crops avoided the wet May conditions and most of the ensuing problems that the 2013 crops suffered from). Despite somewhat wet June soil conditions, only the poorly drained areas (and not the somewhat poorly drained areas of each field) suffered some stunting of growth and much less denitrification of pre-plant or at planting fertilizer N compared to the 2013 growing season. In addition, July was wet as was the first half of August in most regions so corn was essentially stress-free through the early grain-filling period. Some grain corn fields did encounter dry conditions during September but temperatures were cool so minimal stress would have been incurred. Likewise, soybeans never experienced any real drought stress in August and September because of the cool conditions. Consequently, based on soil and growing conditions in 2014, the September projected 2014 corn yield of 150 bushels/acre and a record soybean crop of 49 bushels/acre in NY might be right on. But what about the late planting date for both crops, coupled with the perceived cool growing season? Will that hurt the 2014 corn crop and reduce the projected yield from 150 bushels/acre to 138 bushels/acre as in 2013? Believe it or not, western, eastern and northern regions of NY had above average growing degree days from June 1 through September 30 so delayed planting in those regions are not much of a concern (Table 2). 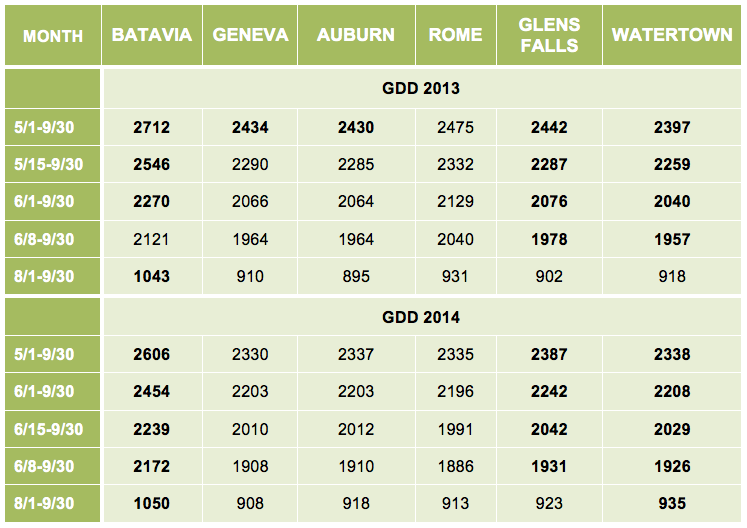 In the Finger Lakes region, however, total GDD from June 1 until September 30 were about 100 below normal (Table 2), raising concerns about crop maturity. Most grain corn and soybean fields in Western NY and the Finger Lakes fortunately have not had a frost event and no frost is in the forecast through mid-October for those regions. In addition, both regions have already accumulated an additional 50-60 GDD through the first 5 days of October. Consequently, if the growers scaled back their hybrid maturity and the crop silked out by early August, enough GDD should have accumulated before a frost so grain corn should mature, albeit with delayed harvest well into November. If growers did not scale back their hybrid maturity when planting grain corn during the first week of June in the Finger Lakes, maturity could be an issue. Soybeans, on the other hand, respond more to photoperiod when planted in June so even if soybean growers did not scale back maturity, soybeans should make it (a 2.4 Maturity Group that we planted in a planting date study at Aurora on May 29 was at maturity or the R8 growth stage on October 1 and planted on June 11 was at the R8 growth stage on October 7th). So I am not concerned with maturity for most of the soybean crop. Table 2. Growing Degree Days (GDD, 86/50 system) in 2013 and 2014 from four planting dates through September 30 and growing degree days from August 1 through September 30, which is typically the grain filling period for corn and the pod set and seed filling period for soybeans in NY. Bolded numbers indicate above average growing degree days compared with the 30 year mean (excluding Rome, which only has 9 years of data). In conclusion, despite another very challenging and yes stressful year from a grower perspective (delayed planting in the spring and fear of potential frost in the fall), yields, according to the grower surveys in September, should come to fruition. The next report is due on October 10th , based on growers surveys in late September, and I hope that the isolated frost reports in the non-major grain corn and soybean growing regions don’t bias the yields down. In fact, light frosts occurred in isolated pockets of these regions on the morning of September 17th in 2013 (31 in Ithaca and Watertown), which escaped the September 19th frost of 2014 (32 in Ithaca and Watertown). So in many respects the 2013 and 2014 growing seasons, including the light September frosts in isolated pockets, were similar, which should bode well for soybean yields. For grain corn, the blessing in disguise of the delayed planting date probably reduced crop damage during vegetative growth compared to 2013,, resulting in 5-6% higher State yields or about 150 bushels/acre. We won’t really know until the crops are in the bin so let’s hope for a great harvest season for both crops.